A two bedroom, 2 bathroom, 2-storey cement and wood house located just half a mile from the main Western Highway in Unitedville Village. The upstairs of the house contains a kitchen with hardwood cabinets, living area, one bedroom and a bathroom. There is also a very large deck area for relaxing and enjoying the breeze and the views. Downstairs there is one bedroom, one bathroom, covered carport, utility room and workshop. There are many fruit trees on the property including: avocado, lemon, coconut, banana, lime, cherry, pineapple, craboo, mango, macadamia, sapodilla, orange, plum, abiu, soursop, pitaya, and raspberry. The house is about ½ mile from the highway and is access by an all-weather road that leads direct to the fenced and gated property. Located on a hilltop in Unitedville Village, there are excellent views of the surrounding Cayo countryside. 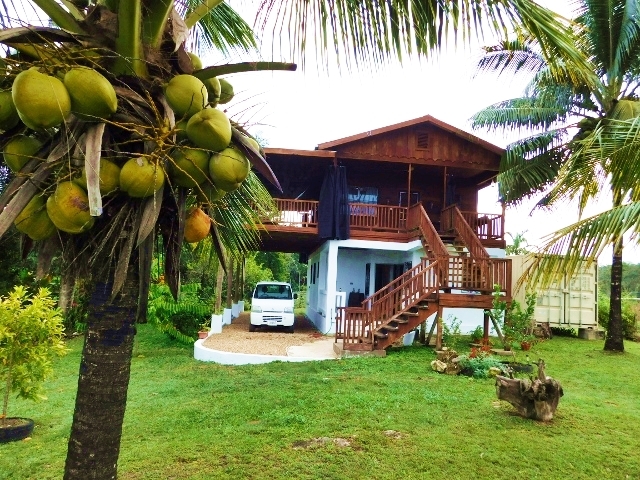 Unitedville is conveniently located between Belmopan, the country’s capital city; San Ignacio, the centre of the country’s inland tourism industry; and Spanish Lookout, a large Mennonite Community. The house is available starting 1st April, 2019 for a long term lease. © 2019 MLS In Belize.